Our itinerary together begins at Baltra airport, from where we’ll sail to the glorious white beach of Las Bachas with a pair of brackish water lagoons only a few steps from the sea. These lagoons serve as feeding grounds for various wading birds, including stilts, pintail ducks and flamingos. 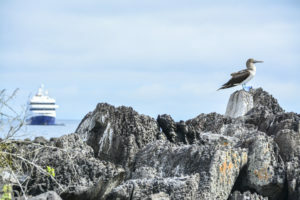 As we continue our voyage, we explore two fascinating visitor sites on Santiago Island: Buccaneer Cove, home to a large number of marine birds, sea lions, and inter-tidal organisms, and Puerto Egas, with its great walk-along pools full of life and good snorkelling and swimming possibilities. The next day we visit the red-sand beach of Rabida Island, a lovely trail around some cliffs and a popular spot for aquatic activities, with some of the best snorkeling in Galapagos! In the afternoon, we round out the day with a stop at Bartolome Island, which offers a volcanic viewpoint with room for hiking, swimming, and exploring the beach and the coast. 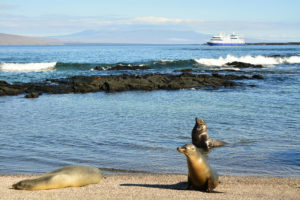 This is our only chance to see Galapagos penguins. What a full and rich day! From here we sail northeast, crossing the equatorial line, to the sunken crater of Genovesa Island, home to thousands of marine birds. It feels like a world a million miles from our own. We finish with an incredible encounter with nature in which we respectfully sharing a wild habitat with giant Galapagos tortoises at a private reserve up in the highlands of Santa Cruz Island and then make our way to the airport at Baltra. Important Note: The Santa Cruz II operates on a 15-day cycle (to cover each separate region of the archipelago), meaning that not all Mondays of the year will serve as departure dates for this specific itinerary. Please refer to our Sailing Dates table for exact departure dates for Mondays of the year. Once we disembark at the beach, we can enjoy a swim or snorkel amid a rocky shoreline, usually in the company of marine turtles. From here, we head off to our walk, a great opportunity to see land and marine birds amid landscape of tuff-stone layers and lava flows. At low tide, marine iguanas graze upon the algae beds and we can also observe a colony of fur seals. After the visit, we had some time for swimming and snorkeling. Today’s afternoon activities begin with a wet landing on the golden beach of this famous island, dominated by the imposing Pinnacle Rock. There’s great snorkeling and swimming from the beach plus the chance to ride the glass bottom boat. After returning to the ship, we split into two group: the first lands for a hike to the summit of this diminutive island that boasts fantastic views of the archipelago. This is a moderately steep climb aided by a wooden staircase, resting platforms and handrails – the view from the top is worth the effort! The second takes to the pangas to explore the rugged and volcanic shoreline. The groups then swap so that each one experiences the full beauty of this island. In the afternoon, we land at this beautiful beach to enjoy some swimming and/or snorkeling. Following our dip, we take an easy stroll to observe hundreds of birds, mainly frigate birds, red-footed and Nazca boobies, gulls, herons, finches and mockingbirds. Opportunity for snorkeling, kayaking and swimming. *This itinerary departs every second Monday. If a Monday does not appear in the list below, it is either because we are fully booked for that Monday departure period or simply because we do not operate this specific itinerary on that Monday departure period due to our 15-day sailing cycle (to cover each separate region of the archipelago).